Since the 1830s, when trains began to deliver summer visitors to Saratoga Springs, the town’s growth and development moved in lock step with popular forms of ground transportation. Tourist, urban development, and transportation maps provide complementary sides of a story about the city’s plans for growth and adaptation to changing times. Maps reveal how Broadway has retained its role as the city’s spine, despite repeated efforts by developers to entice visitors and residents to settle or adventure further afield. 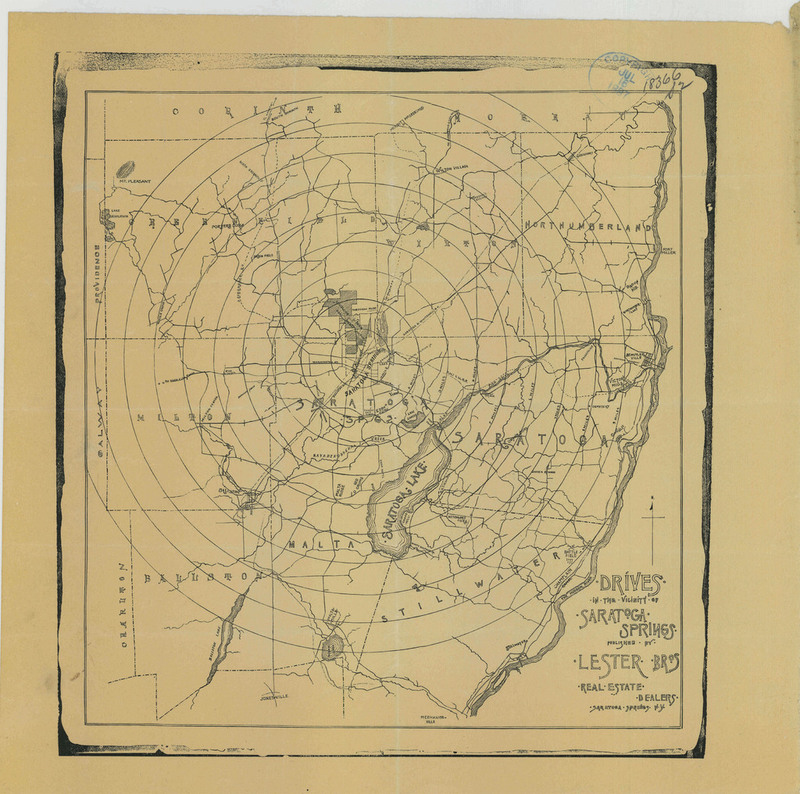 They also track how today’s familiar routes – 9, 29 and 50—began as a network of trails, roads and rail tracks that linked Saratoga Lake to the Hudson River, Albany, and beyond. Dreamers from real estate developers and civic-minded residents to city planners and college professors have used transportation and tourism as ways to imagine the city of the future, keeping land and water always at the forefront of their imagining. Driving has been a Saratoga Springs leisure activity since long before Ellen Walworth appended a map of outings to her guidebook to the Saratoga battlefield in 1877. But until the early twentieth century, most visitors came to the area by rail (and later trolley), and sought out lodging within walking distance of train stations. Once automobiles moved from rarefied vehicles for the chauffeurs-driven wealthy, to the preferred means of travel for most everyone, Saratoga Springs’ boosters and planners used maps to locate car-friendly attractions, repurpose rail transportation, and reroute traffic to keep downtown open for business. This 1887 map indicates a series of driving routes in the area around Saratoga Springs, for carriage rides from south to north (Round Lake to Glens Falls), east to the Saratoga Battleground and west to Mount Pleasant and Ballston. Roads radiate out from Saratoga Springs to each destination. While drivers might explore Mt. McGregor and the White Sulphur springs and hotels south of Saratoga Lake, prominent railroad lines and canals show through routes. 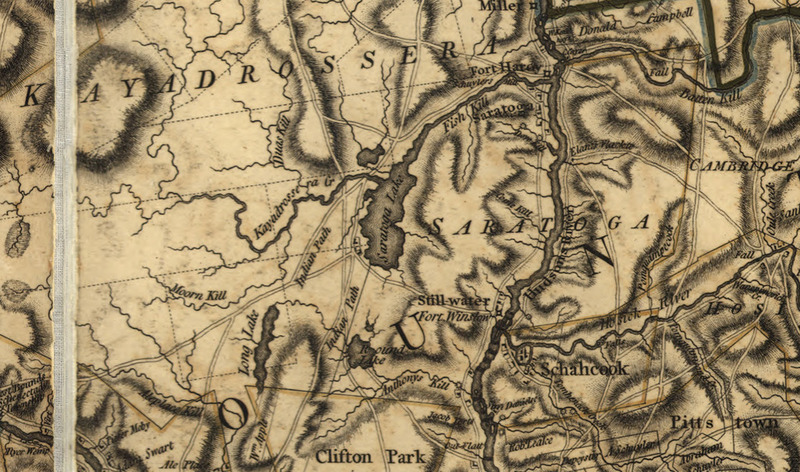 The 1779 topographic map detail shows Indian paths around Saratoga that serve as the basis for several later Saratoga County roads. Saratoga Lake was particularly well connected on the north-south axis and to the west; a “Hudson’s River” crossing took place at Fort Handy, north of the town of Saratoga. 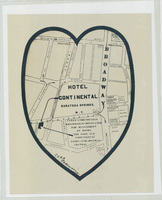 In 1921, this unique heart-shaped map nudged tourists to the “good old” Hotel Continental near the railway. Arrows lead potential clients to a location more convenient to the railroad depots than to Broadway. This kind of advertisement for a single business—billed as “central,” “clean,” “renovated,” and “reasonable”—was likely distributed in town, whether at the trolley station, a gas station or other local business that recent arrivals might stop in. This map asks us to think what kind of visitor would stay here…and what base map would have supplied the sprinkling of different businesses on the map: from city hall and the post office to a plumbing and an insurance comapny, the city park, state baths and Congress Theater. Between automobiles and development of Saratoga Spa Park, the city’s axis extended. This hand-drawn city plan by R. Carey connected downtown Saratoga Springs to the Saratoga Spa Park, directing visitors beyond Broadway. Concentric circles encourage visitors to springs and baths no more than 2 miles from the city’s center (Congress Park) and an easy place to visit or stay when traveling by car. 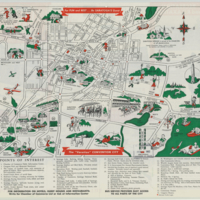 In town, the map focuses on streets whose hotels and boarding houses are listed on the reverse. Lodging choices could fit many budgets or lifestyles: Hotels with "Cure" Diet Available (11), Boarding Houses (3), Hotels Observing Dietary Laws (11, i.e. Jewish dietary laws), and Rooming Houses (44). Principal routes into and out of the city (Routes 50, 29, and 9) draw the eye away from the railroad, and hint at the extent by which 1930s visitors arrived by car. 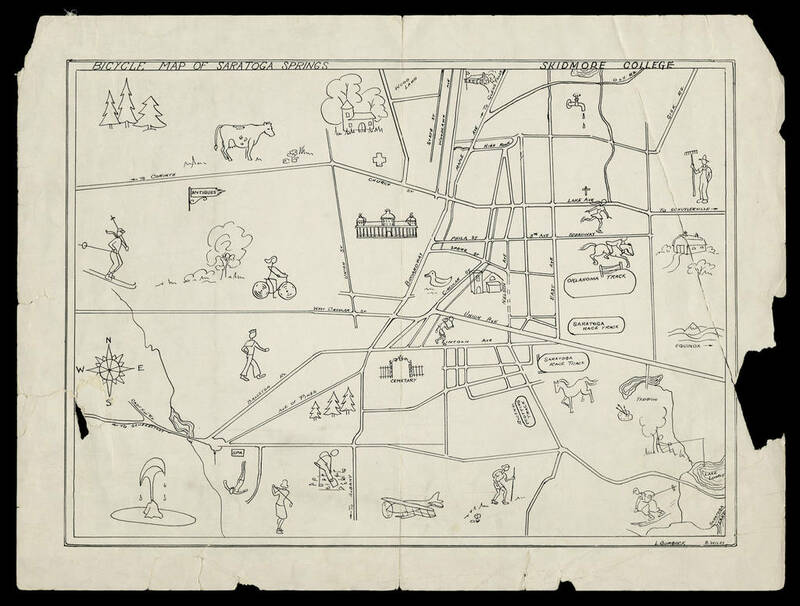 In 1944, Skidmore College education and drama teachers Louise G. Burbeck and F. Elizabeth Wiles sketched this map that encouraged healthy, outdoor activities that could be reached by bicycle. This map’s unusual emphasis on two-wheeled transportation might be partly due to rationing of rubber, metal, glass and gasoline during World War II. Celebration of summer and winter activities—sketched figures ski, play tennis and golf, go horseback riding fishing and sailing—reveal the authors’ goals for the Skidmore women who would have been the map’s principal audience. The map also shows a Skidmorean geography: streets are drawn in detail closer to Broadway and Skidmore’s downtown campus next to Congress Park. Roads get more general farther away from the center of town. Less important but still present are the railway and waterworks. Guidance to more distant destinations may have helped bicyclists imagine longer trips or orient the map reader to the larger geography of the area. 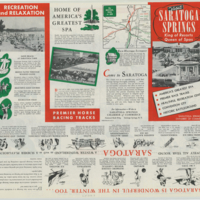 Any 1950s convention visitor or vacationer who accepted Saratoga Springs’ invitation to “be our guest” would encounter something “for FUN and REST,” at least according to this Chamber of Commerce brochure. This map proposes a modern experience in a city described as “thoroughly satisfying...attractive, convenient, hospitable.” Convenience replaces elegance along with entertainment choices and points of interest best reached by car. New attractions include an airport, seaplane landing on Saratoga Lake, a fur farm, the Casino-turned-museum with “memories” of “games of chance,” and night gambling at the new raceway. A Veteran’s facility at the baths suggests a shift from serving the wealthy to healing WWII survivors with Saratoga water’s medicinal qualities. Without including every street name or building location, the map both entertains and informs. By the 1960s, cars were so numerous that traffic was a problem. 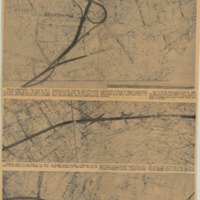 In 1965 The Saratogian newspaper, which had been helping residents visualize activities and proposals with maps and plans since the nineteenth century, printed a map to show the proposed construction of an arterial highway, intended to be a four lane “moderate-speed business access road” to run directly through the center of Saratoga Springs. Although this proposal was never realized, Saratoga Springs now has Routes 9 and 50 both running on Broadway through the center of the city.